One of my favorite computer pass times is to head over to the You Tubes and see if I can find something new musically. I really like music. I like playing. I like listening to it, but what I really like.. is to be inspired from it. That inspiration can be found in many forms – oldies but goodies, a horrible musician, that made a good noise at one point, or even an interview of a musician that makes me think of music in a new way. Usually during this process I find at least one band that caught my ear for whatever reason, so I really try to do this a couple a times per month. The worst is being stuck in a musical rut. I think back to high school and how so much music was ‘new’ to me. Every person I met, every party I would go to, would be a new musical discovery. It’s not because there was more music back then, but I was very open and I wanted to explore. I think it’s good to keep that attitude today. Anyways, I stumbled upon The Joy Formidable and something about it caught my ear. I like the chaos that was created by their effects. I like the drive of the tune countered by the pop/nice vocal style of Ritzy Bryan. I like that this video (by kexpradio) was shot in a bike shop, etc. They are from North Wales, UK and.. I want to hear more. I saw that she was manipulating two pedals, and I had a hard time seeing what that pedal was below her hand in the photo above, but I was able to capture one frame that shows it. 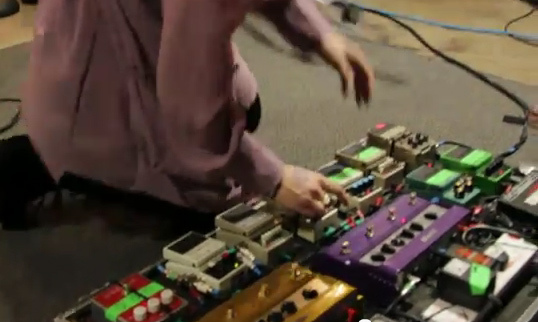 It looks like she’s manipulating a pair of Boss DD-3 Digital Delays. 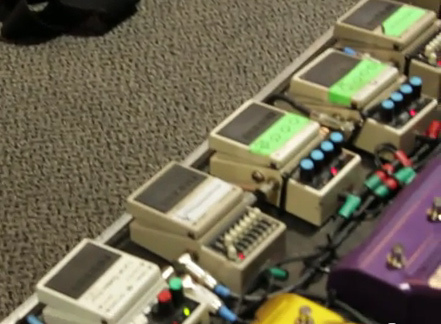 It was also interesting to see that she has a total of 3 equalizers (2 Boss GE-7 and 1 MXR 10 band). I’m guessing she has a lead route and a rhythm route (based on the Boss LS-2). 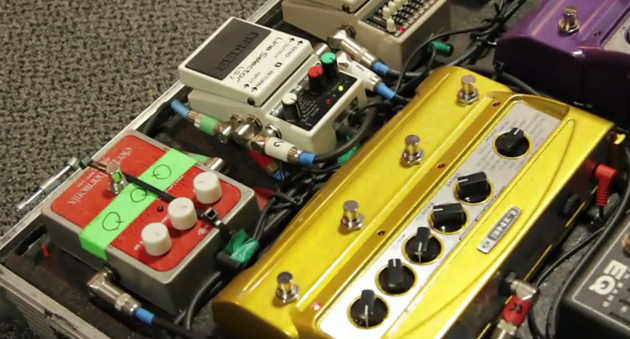 Still not sure what the MXR 10 band is there for. I was unable see the settings on the 10band, but both GE-7 were flat with the exception of the output (so using them as boost maybe?). Let me know if I missed anything.. or if anything is correct by commenting below! Thanks!